HubSpot is a marketing automation tool that makes marketing for B2B SaaS companies easier due to two key things: better results tracking and higher lead conversion rates. I’ve seen the success of this tool on a daily basis in our clients’ results. 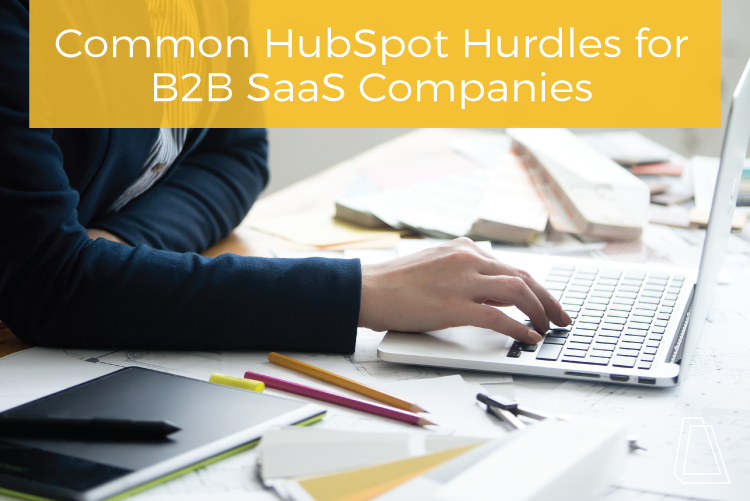 However, I want to bring some of the issues that SaaS small businesses have with HubSpot to the forefront, and suggest some ideas for how to overcome these hurdles. The clients we work with are required to start at the HubSpot Pro level in order to get the most out of our services and the tool. For many B2B SaaS startups, that price tag ($800/month) is overwhelming. HubSpot price can be especially hard to swallow, because HubSpot requires its customers to pay for their entire contract up front. HubSpot requires customers to sign a year-long contract because, according to their pricing page, they’ve “found that customers who can commit to a full year of using HubSpot will be more successful inbound marketers in the long run.” While that may be true, many B2B SaaS small businesses understandably have some concerns about the commitment. We’ve found that companies struggling to understand the ROI of HubSpot before signing on usually benefit from a HubSpot Trial. It’s a low commitment way to test out the tool and see the kinds of results you’ll get from it. Sometimes smaller SaaS businesses can also benefit from having a dedicated person or team (whether internal or external) managing HubSpot. Having a resource like this alleviates concern of contract length because you know the tool will be utilized fully. HubSpot is very stringent when it comes to email. They take great care to ensure that deliverability rates from their tool are high, and that customers are not marked as spam, or blacklisted. If you use the tool and upload contact lists, you will be asked to verify that the people in the list expect to hear from you (basically, HubSpot wants to know that they opted in to your marketing). If your deliverability rates are low and spam rates are high, you might get scolded by HubSpot (no, really, I’ve seen this happen). When you think about it, this is really less of a hurdle, and more so encouraging B2B SaaS businesses to use best practices when it comes to growing an email list. Many small businesses think buying a list is a good place to start, but we’ve found through some of our clients’ experiences that lists are often inaccurate, and the people on a purchased list are more likely to mark unknown senders as spam. It might be frustrating to start from scratch, but earning contact email information ensures your emails get delivered to buyers who actually want to hear from you. As an example, we used inbound marketing to build our list, and in just over 2 years we’ve gone from 40 contacts, to 1450! Here are a few tips on how we got it done. HubSpot has robust reporting tools, but their data isn’t always updated in real-time. Sometimes it takes hours to update. This isn’t usually a deal-breaker for most B2B SaaS companies, but it’s something to consider if you use the tool and have to provide reporting metrics to your team, manager or another stakeholder. Many of the B2B SaaS startups we work with use Salesforce (SFDC) as their CRM. HubSpot has an integration with SFDC that can pull and push data between both systems, depending on your needs. However, many companies dislike the integration due to the fact that SFDC prioritizes the company (or account) level, while HubSpot puts more importance on the contact level. Calling on HubSpot’s support team is one way you can navigate this integration. If you have a marketing team or tech person who can handle setting up the integration, the good news is that this usually only needs to be done once, and only revisited with few one-off needs. As mentioned above, many businesses use SFDC; while it’s a great tool for some sales teams, sometimes it’s a bit robust for startups. The criticism of the HubSpot CRM is that it isn’t comprehensive enough for Sales. I’ve found that most of the people saying those things work at larger companies—and they are right, it isn’t a good fit for them. If you’re a startup, the HubSpot CRM is a great option for you. It’s easy to use, has a lot of the must-have features of a CRM, and most importantly, it’s free. Forever. Do you have questions about HubSpot, or how to get the most out of the tool? Request a consultation so I can chat with you, or learn more about HubSpot trials and how they can work for you in the below video. Have any additional items you’d add to this list? Sound off in the comments below!